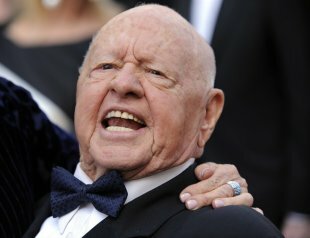 As the details of Mickey Rooney's death will make headlines today — he disinherited his eight surviving children and his estranged wife just weeks before his death, leaving his meager $18,000 estate to his stepson and caregiver Mark Rooney — so do claims that the Hollywood legend was a victim of elder abuse. According to the Associated Press, Rooney said he lost most of his fortune because of elder abuse and financial mismanagement by another of his stepsons, Christopher Aber. He cut his children out of his will because they were better off financially than he was. Rooney's lawyer, Michael Augustine, said that an agreement was in place for millions to be repaid to the 93-year-old actor, but it was unlikely the estate will ever collect on it. Almost three years ago, Rooney appeared before a U.S. Senate committee that was considering legislation that would crack down on elder abuse. In March of 2011, then-90-year-old Rooney told the Senate Special Committee on Aging that he had been "stripped of the ability to make even the most basic decisions about my life" and financially exploited by his stepson, Aber, and didn't seek help because he was "overwhelmed" with fear, anger and disbelief. "But above all, when a man feels helpless, it's terrible," Rooney testified. Engaging in a war of he said/he said, Aber told the Daily Mail that his younger brother, Mark, and his wife were the real abusers, not him. "They were keeping him from access to a phone, they kept him hostage," he claimed, making the horrific accusation that Rooney died of choking on his own food with no one there "to pat him on the back." News outlets have reported only that Rooneydied of natural causes, including complications related to diabetes. Read Aber's messy allegations here. Elder abuse has been making headlines in Canada this month. Toronto woman Norma Marshall, 94, was victimized by her housekeeper and her family who systematically spent Marshall's life savings and sold her belongings without her knowledge, confining Marshall to a small room in her own home. A delivery man for a local pharmacy determined something wasn't right when he dropped off her medications and alerted authorities. And earlier this week, we shared Bert Matthews' story. Matthews claims he was tackled and restrained at a Vancouver Island hospital after he tried to leave. He went to the hospital fearing signs of a heart attack or stroke and was admitted, instead, to a psychiatric ward. According to a poll commissioned by Bayshore HealthCare earlier this year, one in five Canadians visit their elderly loved ones just twice a year at most, citing distance and busyness as reasons for staying away.